Today Facebook announced its 2014 Games of the Year. The top winner? Cookie Jam, a Candy Crush Saga clone. If this is the best Facebook has to offer, I'm done. I realize that most of our readership was done with Facebook games from the word FarmVille. They're bothersome, annoying, formulaic, et cetera. But I've seen some pretty great games come out on the social network in the past — first-person shooters, Diablo-esque action role-playing games, deep strategy titles — and I've held out hope that those sort of games would arrive in greater numbers. But it's just not happening. 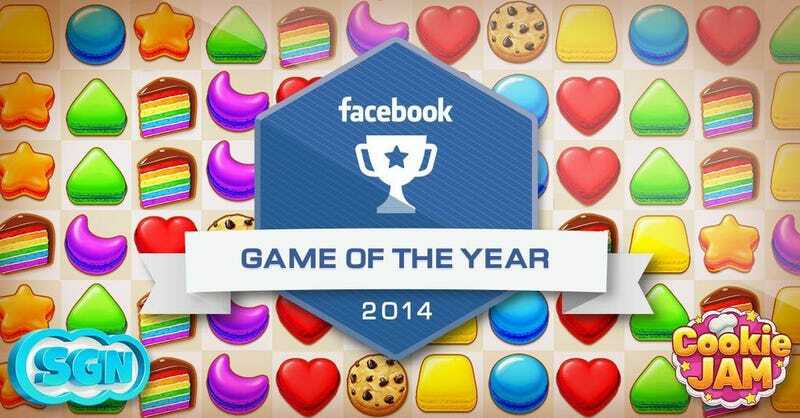 This 2014 Game of the Year award shows where Facebook's gaming interests lie. Here's its entry from Facebook's Games of the Year blog post. This colorful matching game proved that the genre is far from over for Facebook. Launching last May, and rising to well over 5 million players in only a matter of months, SGN's sweets-themed title swept all others to become the Game of the Year. That really says it all — high player counts are more important than innovation. There are still good games on Facebook, but they're few and far between and in incredibly poor company. Meanwhile, Apple awarded Game of the Year to Monument Valley and Threes, a pair of smart, innovative titles that own their success. It's fairly clear which way the wind is blowing, and I'm riding it away from Facebook gaming for good.